Call it a fluke, or divine intervention, but the chestnut yearling that 15-year-old Kim Frerichs Johnson picked for his beauty in 1973 at Idaho's War Eagle Arabians was destined to become the foundation sire for a successful line of purebred Arabians and the dream of a lifetime. Her parents presented her with this colt, Belesemo Trad, as a surprise for her 16th birthday. 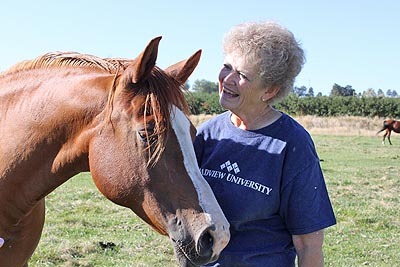 I met with Kim at her Belesemo Arabians ranch, in Caldwell, Idaho, on a May afternoon. Lulls in activity are rare during and after foaling season, but she took a break from her non-stop work to talk with me. "Trad was never picked because of his outstanding conformation, because of his outstanding pedigree, or any of that," she told me. "It was a total fluke. It was not something that was planned. Actually, I don't call it a fluke. It was a blessing." "Belesemo Trad was simply a fantasy, larger than life," Kim wrote about the flashy chestnut in 1985. "He was the culmination of all my dreams after reading stories such as King of the Wind and the Island Stallion. He was perfection personified." "Belesemo" is Italian for "beautiful," and Belesemo Trad (Las Trad X Alla Mem, by Alla Kas) was certainly that, with his 4 perfect stockings and perfect blaze. Kim and Trad had a successful show career in high school and college back in the late '70s and early '80s when the class A show ring was huge. "He was very, very versatile," Kim said. "He won 5 different divisions, and neither one of us knew what we were doing. We had no professional training. We just watched all the videos and went to all the clinics we could. He was the true all-around Arabian." Trad was left a stallion, simply because Kim and her parents never gelded him. "There wasn't a person in the horse industry who didn't tell my folks he should be gelded, because I was a young girl with a stallion. And I totally understand why they all thought that. It was just kind of assumed he would be gelded, because he was supposed to be my show horse in the future. But we never got around to it." He was not an easy horse to handle. "He was a very tough horse from the aspect of he had a mind of his own. He wasn't mean; there wasn't a mean bone in his body. But he was tough, which I think is the reason it stood him in good stead in his offspring, their toughness on the trail later." After Belesemo Trad started winning in the show ring, people became interested in breeding to him, even though Kim and her family had no place to stand him at stud. He was 9 when his first foals hit the ground. Endurance riding was nowhere on Kim's radar at the time, but those genes for natural endurance talent would still find their way to the surface in many of his offspring. One of Trad's first foals was out of his full sister, Krija Beden. "That's not even something I could consider now! But she was one of the only purebred mares I could find at the time," Kim said. The resulting filly from this cross, Belesema Flirtasia, became an outstanding endurance horse. Ridden her first 2 full seasons by Bob and Arlene Morris, she was then bought by Dean and MJ Jackson, of Idaho. Dean took Belesema Flirtasia on to over 4100 AERC miles, and several national titles including National AERC Mileage Champion, and National AERC Best Condition Champion, in addition to numerous Regional awards. Belesema Flirtasia was the first horse of Trad's that did well, but by the time she started showing her best stuff, she was 9 and 10 years old, which made Belesemo Trad 19 and 20 before he started getting discovered as an endurance sire. "Trad came to that late in life, simply because breeding for endurance was not something people did at that time, unless you were Rushcreek, or HCC [Hyannis Cattle Company]. We didn't really know anything about endurance until his offspring started doing really well." A number of endurance horses sired by Belesemo Trad during his late demand as an endurance stallion garnered impressive records and awards throughout their careers. Belesemo Tradition (out of Velvet Dawn), owned by Dean and MJ Jackson, earned over 5300 AERC miles, and titles of National AERC Mileage Champion, National AERC Husband/Wife Team Champion, 18 Best Condition awards, and an 8th place Tevis Cup finish. Belesemo Bolero has over 3500 miles. Belizair, Belesemo Legacy, and Kismet Flashdance have crossed the 2000 mile mark; and a number of offspring have reached over 1000 AERC miles. Belesemo Trad also sired numerous successful offspring in the show ring, with Belesemo Epic+++/ topping the list, receiving many National Sport Horse awards, and going on to become a successful sire himself. Tragically, Kim's foundation stallion died in 1997. "When I lost Trad, that was extremely tough," she said. "I lost him the day before he turned 25, and I lost him before I got any mares bred to him that spring. So I had the last foal crop coming from him, and that was all that drug me back out to the barn, because I just couldn't go out there and see his stall empty." Belesemo Magic (by Belesemo Trad out of Zimara, by Gazi) stood at stud at the ranch beside his sire until his death in 2014 at the age of 33. Despite standing in the shadow of his sire for many years, Belesemo Magic also became a successful sire of sport horses and endurance horses, with several AERC National Champions to his credit. "Magic represented the best of the Belesemo Arabians breeding program. He added the quiet, gentle spirit that Belesemo Arabians have become known for from his wonderful line-bred Abu Farwa dam, Zimara." Kim still has 2 of Belesemo Trad's sons standing at her ranch, carrying on his legacy. Belesmo Image is 25. He's out of Farweyna, one of 5 Abu Farwa granddaughters that Dirk and Kim obtained in the early 1980's to breed to Trad. "Nobody wanted the mares anymore because they were over 20 years old. Belesemo Image is the last foal out of those old foundation mares." Image carries old line CMK/Davenport pedigree that features close-up breeding. His foals inherit his size and substance and are finding success on the endurance trails and in the show ring. The other son of Belesemo Trad standing at the ranch is 19-year-old Belesemo Ibn Trad (out of Velvet Dawn). He's a full brother to Belesemo Tradition, mentioned above. Ibn Trad's offspring are on the way to success on the endurance trails and in the show ring, but, Kim said, "at 19, he is really just now getting a chance to produce some bigger foal crops. "It takes SO LONG," Kim said. "People don't understand, when you're trying to prove a stallion in endurance, they're only 5 when they start competing, and they may not get good till they're 10. And most stallions are not bred when they're out running on the trail, because you don't know how good they are. So usually they don't even get a chance to start siring endurance horses till their mid-teens. 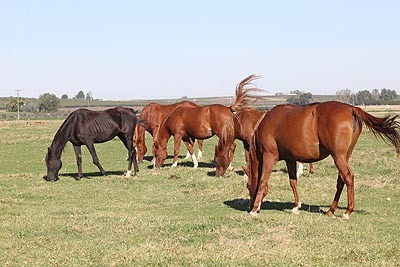 And by that time it takes another 5 to 6 years before their offspring are doing well, so consequently these horses are 20-some years old before they become established endurance sires. "Breeding is a waiting game. It's a lifetime commitment, and unless you have a passion for it, you don't get into it." Kim currently stands two other stallions at Belesemo Arabians. BR Gold Sovereign (*Seffer x PR Silvern Dream), a winning National Sport Horse, is an almost 100% pure Crabbet Arabian stallion from Sojourn Arabians in Pulaski, Tennessee. The 15.1 hand stallion provides a great outcross for the continuation of the performance and sport horse halter blood lines sought by Belesemo Arabians. He is also a Breeders Sweepstakes Nominated Stallion. Belesemo Obsidian (RD Arizon x Velvet Dawn) is a Class A Reserve Grand Champion Futurity Stallion and the Idaho Breeder's Champion Futurity Stallion at halter. He is a paternal sibling to National Champion endurance stallion BA Fantizon, and out of the same dam as AERC National Champion Belesemo Tradition, making him both a maternal and paternal sibling to AERC champions. He has already sired halter, pleasure driving, and trail winners. Belesemo Arabians produces a few select foals from proven matings every year, and the ranch primarily deals in selling young stock. Kim points out that the Arabian breeding industry is going through a metamorphosis. "When I was getting into this in the 1980s we were breeding 35,000 purebred Arabians a year. Every decade that is halved. In 1990 it went to 17,500. In 2000 it went to 8500. In 2010 it went to 4500. But now, 2015, it was just over 3000 in the whole United States." If one can assume two-thirds of those 3000 Arabians were bred for the show ring and likely don't have the bone or feet or mind or conformation for work, that probably eliminates a good number for the endurance trails. And with several major breeding programs now gone (Hyannis Cattle Company, Rushcreek, Suzie Creek Arabians), and the recent deaths of major players in the breeding industry (Al Marah's Bazy Tankersly, Varian Arabian's Sheila Varian, Om El Arab International's Sigi Constanti), the numbers of purebred Arabians available with long-established, proven bloodlines diminishes. Belesemo Arabians strives to continue Belesemo Trad's validated lines. It keeps Kim busy, with around 50 head of horses at all times on the ranch. "You just can't leave. Horses are horses. Invariably they colic, they get upside down cast, they get out - it's just the nature of the beast." Kim could not run the ranch, weather the storms, and enjoy the successes without her husband Dirk. "By nature he is not a horse lover. He's a farmer. He just doesn't have that empathy with the horse type thing that all the rest of us do. He just does it for me. "He has been my literal absolute mainstay. He takes care of all the facilities, he irrigates all the pastures, he catches all the gophers, he changes all the hands lines, he hauls all the hay. He's given wings to my dream as far as it being a breeding program. "I could only do so much of that on my own. I can't do the breeding program, I can't take care of the horses, I can't handle the horses, I can't foal the mares, I can't breed the mares, I can't daily handle the babies. I can't do all that - a full time job - and take care of the place. So I'm very sensitive to his ability to keep me going all the time as well. It's a pretty big undertaking. "The day he says 'I'm done,' then I'm done." But they'll still be around for the foreseeable future, breeding and raising excellent purebred Arabian endurance and sport horses, continuing the lines of her foundation stallion beautiful Belesemo Trad. "Trad was something that we didn't set out and search for a foundation stallion for a breeding program. But it was obviously the Lord's plan. Just because of the unique individual he was, he became very dominant as a sire of that type of horse. "I have been so blessed, and there have been so many neat people that I've met in the sport that ride our horses. We've made some life-long friends through it."